While I am wondering where summer is hiding, and rain is dripping down on my evergreen garden, it feels like the perfect time to start baking scones for tea. How else will you lock out the dreariness that comes with the looming end of joyeus long days, summer dresses and dainty shoes. There has to be tea, and something to go with it. Tea was introduced to England by Catherine of Braganza, the Portuguese wife of Charles II, in the mid 1600s. Her dowry included a chest of tea. It isn’t certain when exactly the afternoon tea ritual was introduced. The most popular tale is that the 7th Duchess of Bedford had invented it in the 1840’s to fight a ‘sinking feeling’ during the late afternoon. Knowing that in the 18th century people had to wait for dinner until eight o’ clock after having breakfast, I would have had many sinking feelings in the afternoon as well. The Duchess would have had a tray with tea, bread and butter in her room in the afternoon and soon she started to invite friends to have tea and refreshments with her as well. 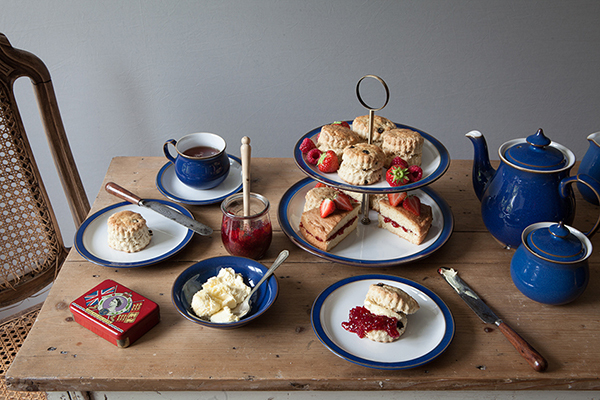 By the 1880’s it became a social event and soon the etiquette surrounding a proper teatime occasion was born. There should be fresh water in the teapot at all times, and loose-leaf tea is believed to be best. 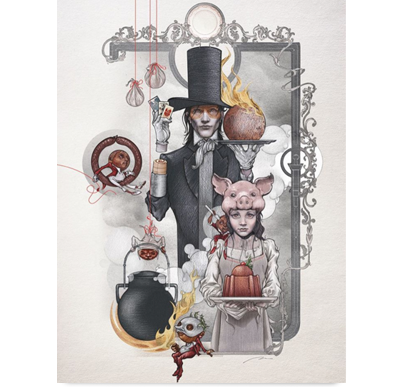 The tea caddy should always be placed closest to the host to show that she or he is in charge. 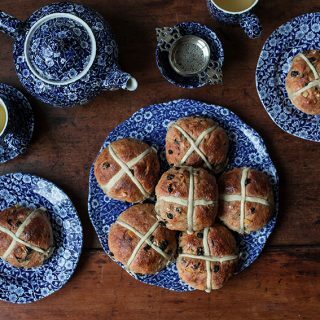 On the tea tray should be the teapot, a sugar bowl with sugar tongs or a spoon if cubes aren’t used, a milk jug, a tea strainer, a bowl for the used tea leaves, a dish with lemon wedges, a lemon fork and a pitcher of hot water to dilute the tea if a guest would require it. On the tea table: teacups and saucers, forks and spoons, small cake plates, napkins – preferably linen. 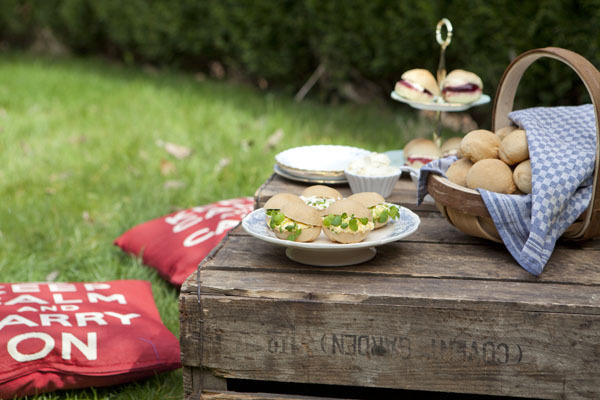 A plate filled with sandwiches, warm scones and small cakes. 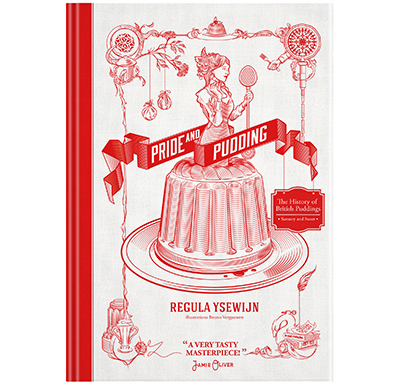 A pot of the best jam, double cream or clotted cream each with a spoon. Then there’s that other thing, ‘the cream or jam first’ debate, that Devon and Cornwall have been fighting over for decades. I guess it is no longer about what’s proper but how one likes his scone. I like to break my scone in pieces bit by bit, then I spread on a layer of jam (and when that jam is home-made raspberry jam it can be some kind of heaven) then spoon on a generous dollop of clotted cream. 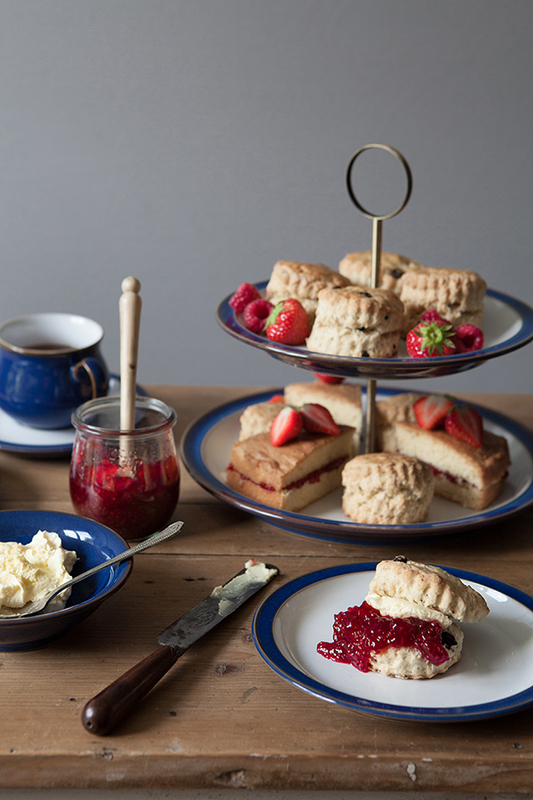 I believe a scone shouldn’t be too sweet, that way you can generously spread it with cream and jam without feeling too guilty or going into a sugar coma after 1 scone. The secret to the best risen scone is not to overwork the dough and not to turn the cutter while cutting out your scones. This is my perfect scone recipe, I like them rough instead of soft, with a crumbly outside and a soft inside. 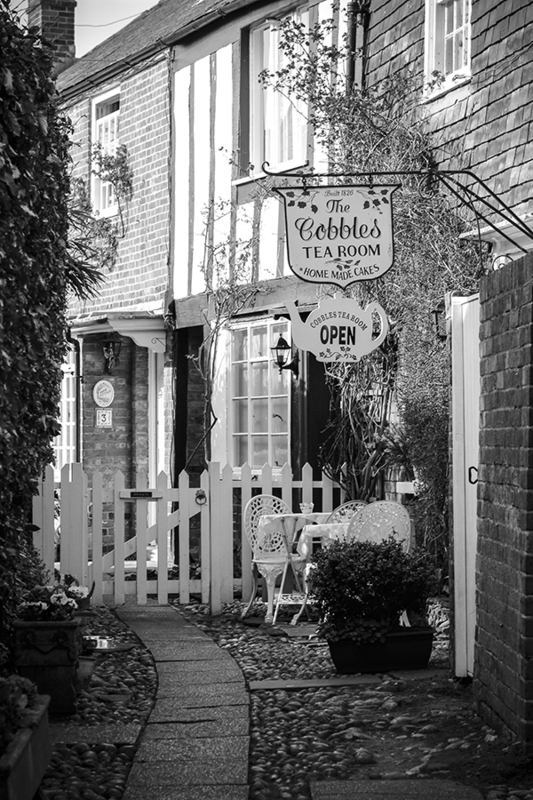 Just like I remember my first scone and the scones I enjoy most at my favourite tea-room. 1. Put the flour into a bowl and add the butter and rub it in until the mixture resembles breadcrumbs. 3. Add the egg and gradually add the milk stirring it in until you have a soft, slightly sticky dough. 4. Turn the dough out on to a generously floured working surface and gently knead it for a minute until it ceases to be sticky but still soft. 5. Now flatten it to a thickness of 2cm. 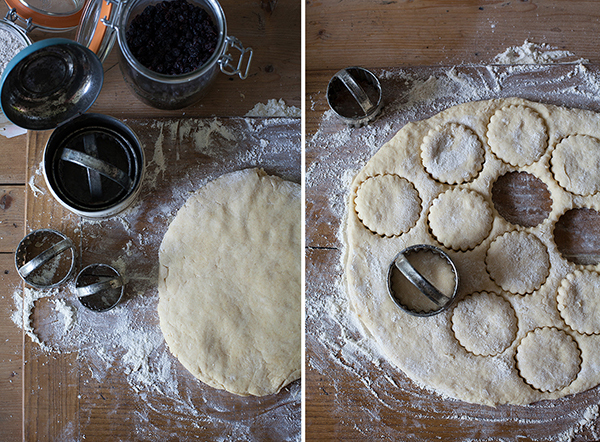 It is better to do this with your hands as opposed to a rolling pin, this will help the scones rise better. 6. 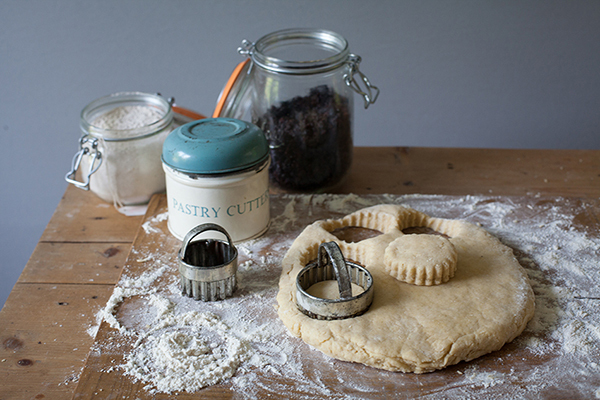 Use a 5cm (or use a larger one for larger scones) cookie cutter to stamp out the scones by pushing it straight down into the dough without turning it, then lift it straight out. This will provide a better and more even rise as well. 7. 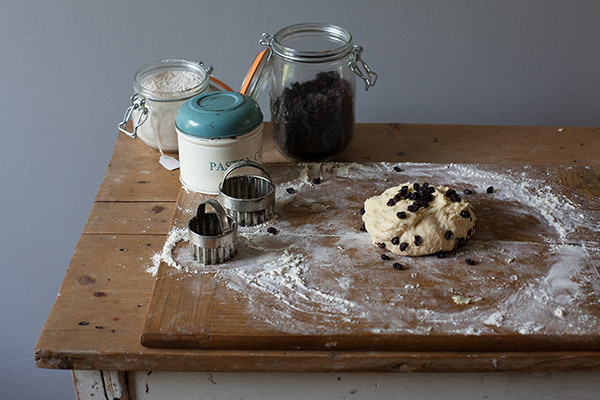 Push the leftover dough together and knead lightly, add currants if you like and flatten again and cut out more scones. 8. 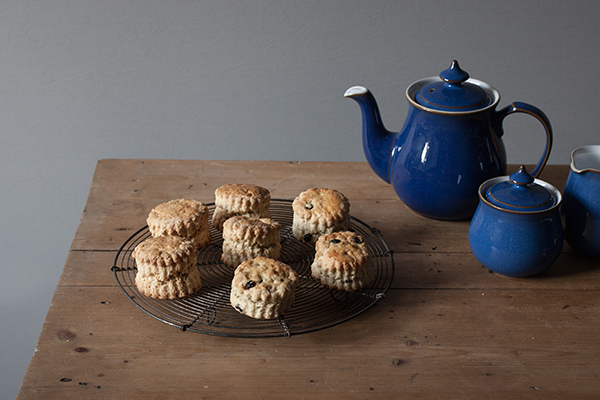 Arrange the scones on your prepared baking tray and brush the tops with beaten egg. 9. Bake for 10 to 15 minutes in the middle of your oven until risen and golden. 10. When ready transfer to a wire rack to cool. 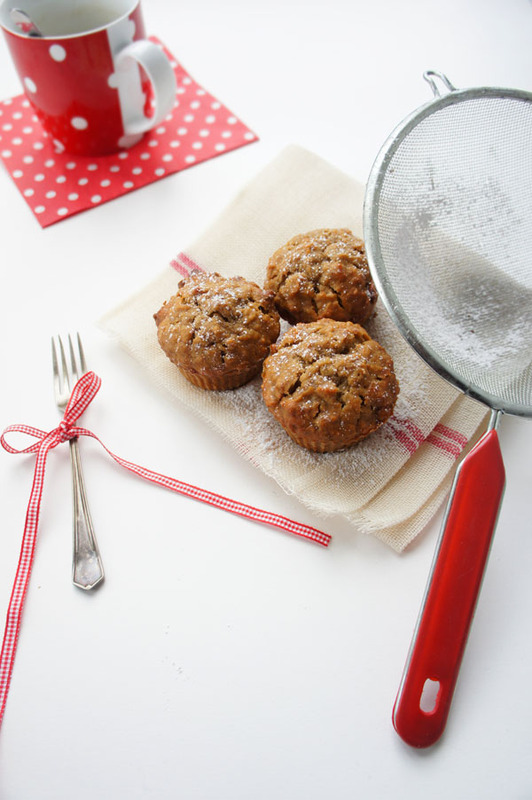 When cooled, cover them with a tea towel to keep them nice and moist. You can freeze scones perfectly, just defrost the evening before in the fridge and warm as suggested above before serving. While moving my blog the comments on my last few posts got lost, I’m so sorry if you are looking for your comment and it isn’t there. I’m really sad about losing our conversations! 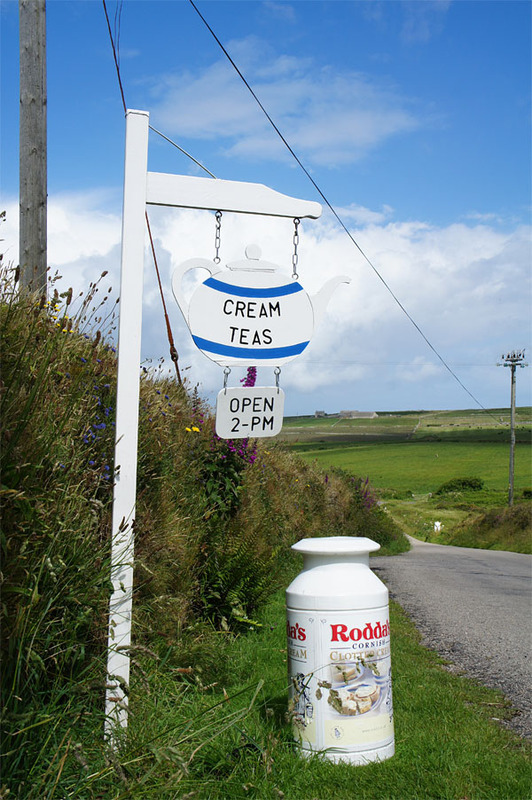 In Cornwall, a cream tea was traditionally served with ‘Cornish Splits’ rather than scones. 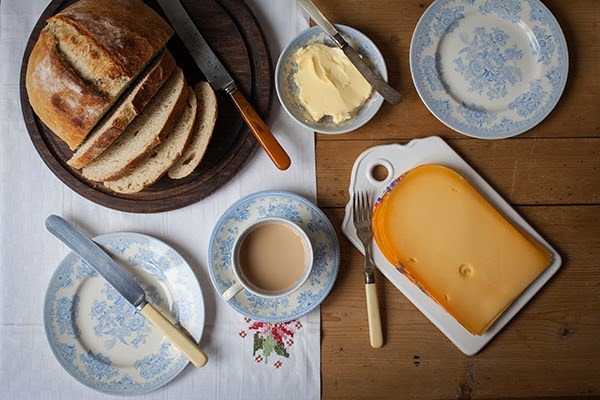 Cornish splits are little yeast-leavened bread rolls, they are split when still warm and first buttered, then spread with jam before topping it with a generous dollop of clotted cream. 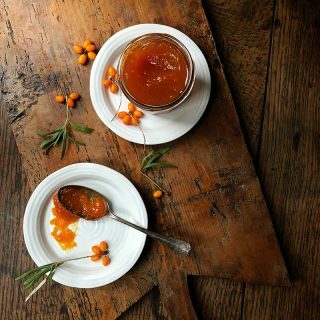 Sometimes Treacle would be used instead of jam, this combination goes by the name of a ‘Thunder and lightning’ and although I’m not a big fan of treacle straight from the tin, it tasted -and the name sounded- rather good! 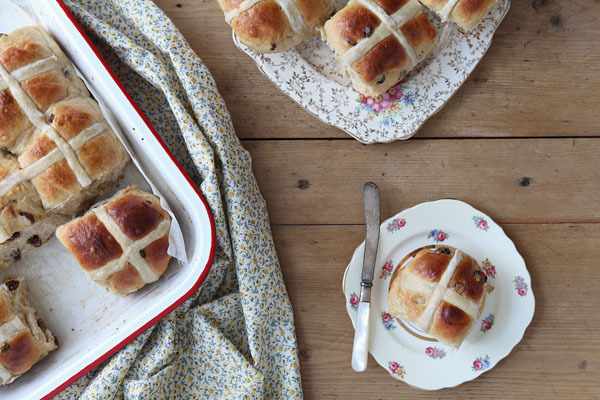 The splits are only baked for a short while and when removed from the hot oven, the little warm splits are then piled up in a tea towel, rubbed with a little butter before being covered by another tea towel so they don’t develop a crust. I haven’t found any earlier reference to a Cornish split than the receipt in on of my favourite books ‘Good things in England‘ published in 1932 by Florence White, a delightful collection of 853 regional English recipes dating back as far as the 14th century. 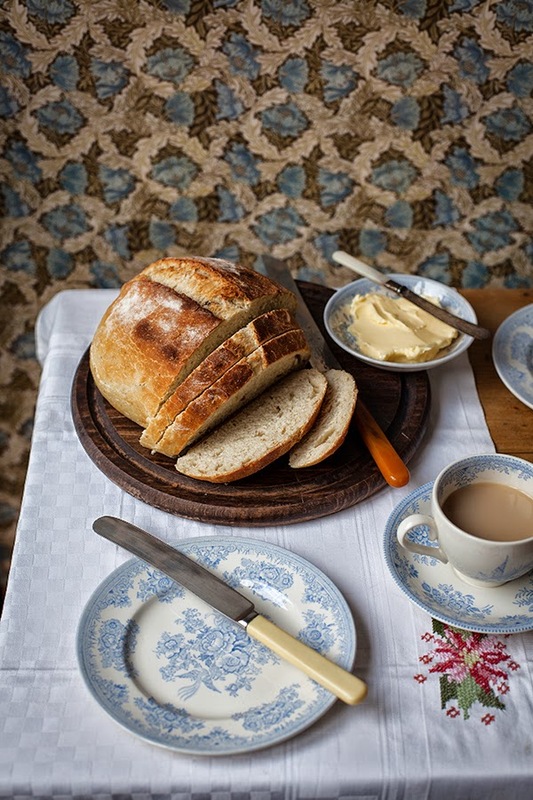 With findings of evidence at Tavistock Abbey in Devon it is believed that the tradition of eating bread with cream and jam existed in the 11th century. 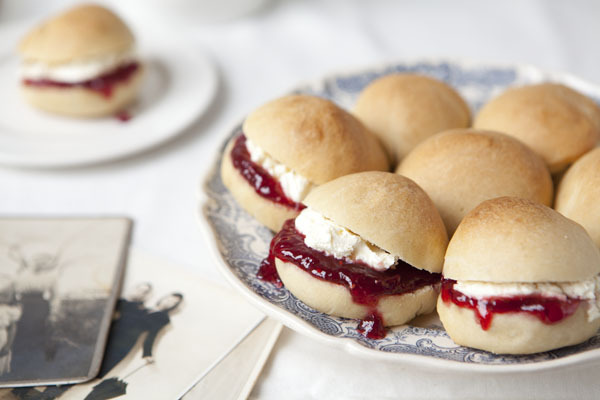 In Devon a similar bun is served with cream and jam, going traditionally by the name of a Devon Chudleigh as noted by Florence White and Elisabeth David Chudleighs are made the same manner as the Cornish split, only smaller. Devonians however tell me that the ‘Devon split’ -as it is called now- is in fact a lighter and more luxurious white bun rather than heavy scone-like bread as the Cornish version. The Cornish split is a rare treat these days but as they are best eaten while still a little warm from the oven, you get the best split by baking them at home. I have another thing to share with you today, my beloved blog has been nominated for the Saveur Magazine 2013 Best Food Blog Award in the ‘Best Regional Cuisine Blog‘ category. I am still pinching myself, to be a finalist and especially to be selected by the judges in this respected international competition is a great honor. The other four blogs that are nominated have all been blogging quite a while longer than I have and are all gorgeous. This blog means the world to me, each post comes from a place deep in my heart. I know it sounds terribly cheesy but it is the truth. The moment I hit the publish button is still as exciting as if it was the first time – even more. In the beginning of writing my blog I was wondering ‘helloooow is anybody out there?’ now I know you are there. 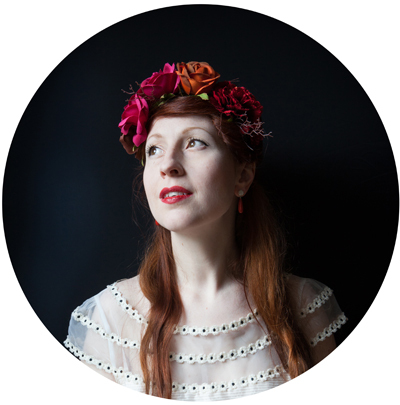 A blog post doesn’t feel quite complete without the first comment from one of you and usually that first comment is from a lovely girl named Rosa. Each comment brightens my day a little more, even if the comment is just to say ‘hi there’, it matters to me. To know that you are out there, reading, listening and sharing my stories and yours with me is one of the greatest gifts on this earth. Your support, your time and your kindness mean more to me than I can say. 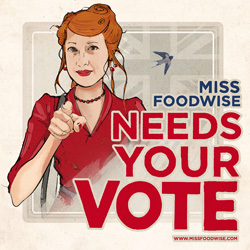 Oh yes… one more thing if you like to vote for me or one of the other fabulous blogs nominated, you can do so by following this link here -> Voting ends this friday the 19th. You have to register to vote, this makes it just a fair competition but takes a minute longer. I thank you if you take that minute for me. taste. This recipe is somewhere in between the recipe of David and White using all milk instead of a mixture between milk and water. I also added an extra spoon of sugar to feed the yeast. Cream the yeast and the sugar in a little of the tepid milk. Melt the butter and the lard, when most of the butter and lard have melted take of the fire and stir until all the lumps are gone. Be careful not to let the butter and lard get too hot so it burns. In a large bowl combine the butter and lard with the flour, the salt and half the milk. Add the yeast and combine. Add the rest of the milk to create a dough, take it out of the bowl and onto a clean surface and knead for 10 minutes – it is important you do it for exact 10 minutes. Place the dough back in the bowl, cover with a clean tea towel and leave it to rise for 45 minutes – 1 hour or until the dough has doubled in size. When the dough has doubled in size, knead it again to turn it into a long sausage. When you remove them from the oven Florence White recommends you rub them over with some butter and then wrap them in a tea towel to cool so they don’t develop a crust. You can keep these little buns for 4 days in an airtight container. Before use, place in a hot oven with a small container of water for 6 minutes. Then wrap in a tea towel as before. 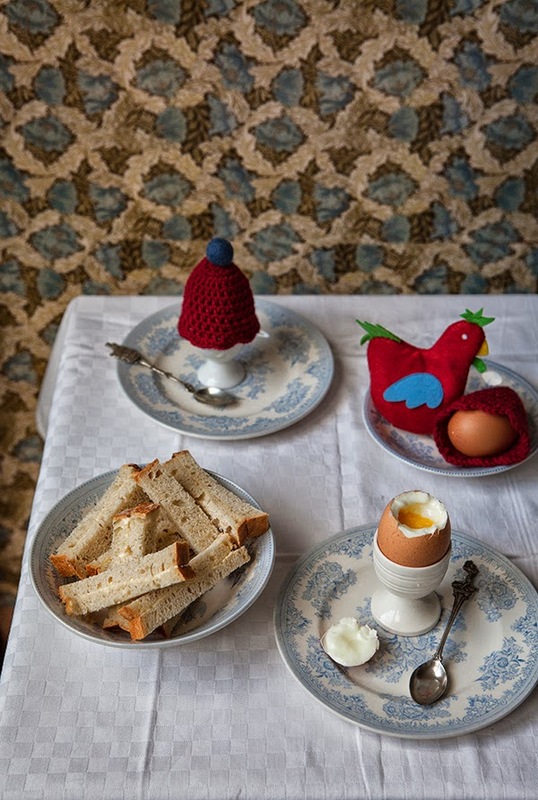 Enjoy with clotted cream and jam, treacle, or why not go for savoury with the old school favourite egg and cress. 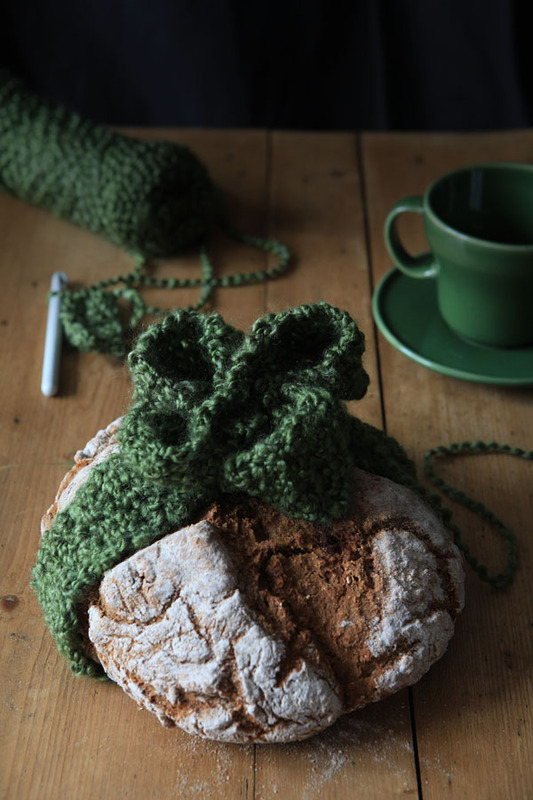 A lucky shamrock scarf for your bread, to keep your hands flour-free. It’s been years since I crocheted! 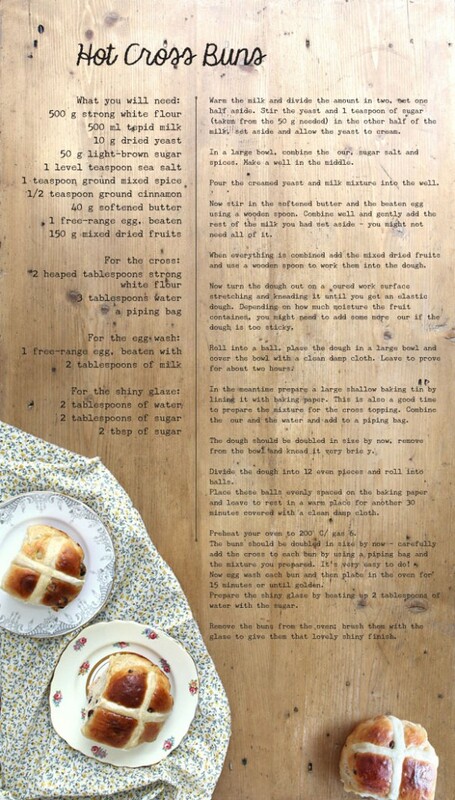 I was asked by Honest Cooking online food magazine to share a St-Patrick’s day recipe with them. 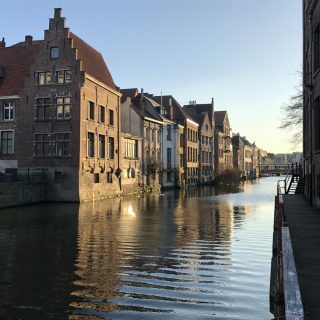 I’ve never been in Ireland so therefore St-Patrick’s day is something I only know from visiting the Irish pubs that used to be plenty in Antwerp. 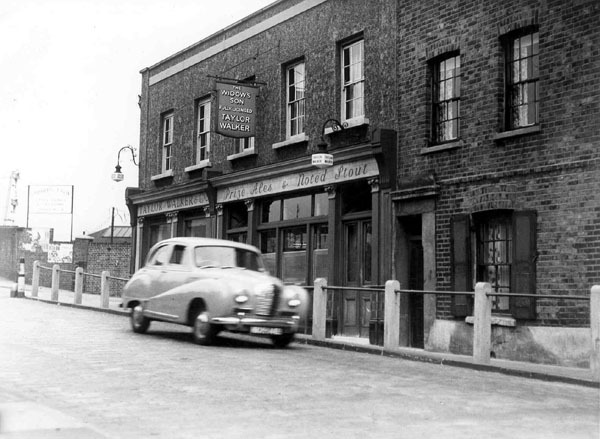 The day would be advertised on the pubs blackboards weeks in advance offering live music and a Paddy’s special menu. 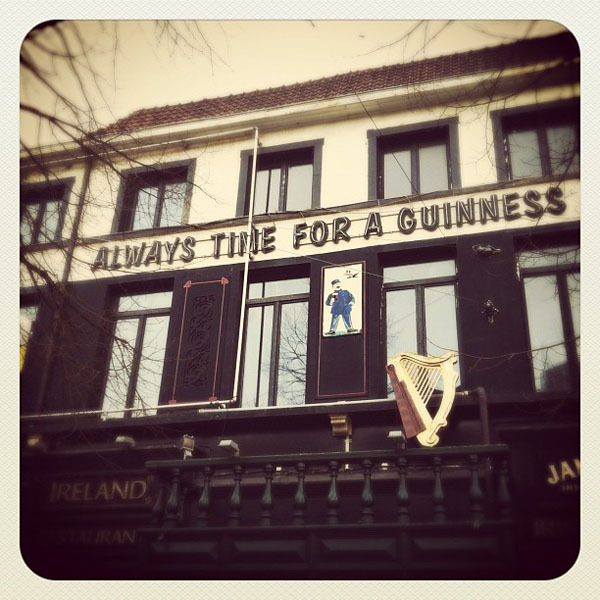 When the day finally came, the Irish folk living in Antwerp and the Irish sailors who were docked at Antwerp port with their ships would gather at the pubs to enjoy a pint and a meal, you would hear the traditional Irish folk music from behind the corner along with loud and often drunken sing-alongs. 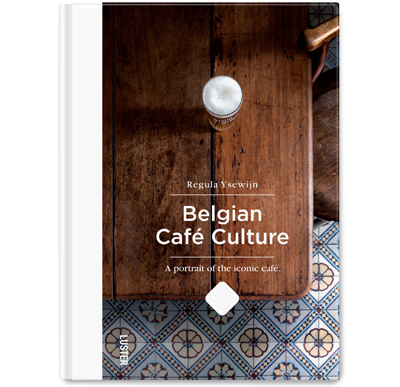 In Antwerp you most certainly knew when it was St-Patrick’s day … But as the Irish pubs started to disappear, the St-Patrick’s day celebrations and the taste of Irish food went with them. Combine the flour, baking soda and salt well in a bowl. Add yoghurt and stout and mix with the dry ingredients. Quickly form a wet dough – it is important to get the bread in the oven as quickly as possible and not to overwork it – if the dough is too wet dust with flour until you can shape it. Dust it with flour and cut a cross in the dough half way down the dough. Put on the baking tray in the middle of the oven for 40 minutes. The bread is ready when it makes a hollow sound when you knock on the bottom. I like to place a small container of water with the bread in the oven, the moisture will help the bread get a tender crumb. Soda bread, time to bake. 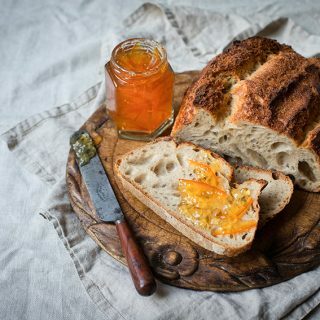 On saturday mornings I look forward to a wholesome slice of bread, spread with -when I have the time to make it- home made butter and a sprinkle of seasalt or jam that reminds me of the warmer days of the year passed. But it has become so hard to get a decent loaf these days, I admit I’m not the easiest of customers but I think my wishes aren’t odd at all. I want ‘real’ bread made from good quality – organic – stone ground flour, not low protein Chorleywood style loafs or other breads that have been made in a jiffy filled with additives and bread enhancers that feed food intolerance and allergies. Many people don’t realise that when they buy this unnaturally square shaped spongy bread they get more than they bargained for. Chorleywood bread is one of these wonderful inventions of the 60’s when everything had to go fast and had to be industrialised. The ingredients don’t only list low quality wheat flour, water, salt and the double amount of yeast used for ‘real’ bread, it also contains a cocktail of hard fats, ascorbic acid, enzymes, emulsifiers and other chemicals that speed up the process. 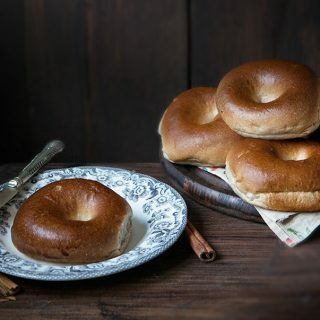 Some scientists claim that the Chorleywood method is responsible for the growing amount of people who have trouble digesting bread, the use of potassium bromate (E924) -which is now banned in the EU but not the US- being the primary cause. Potassium bromate is carcinogenic and nephrotoxic to experimental animals, causing cell tumors to the thyroid and Renal cell carcinoma. I apologise for the usage of these scary words but when I found out about this an researched it some more I felt I had to share it with you. 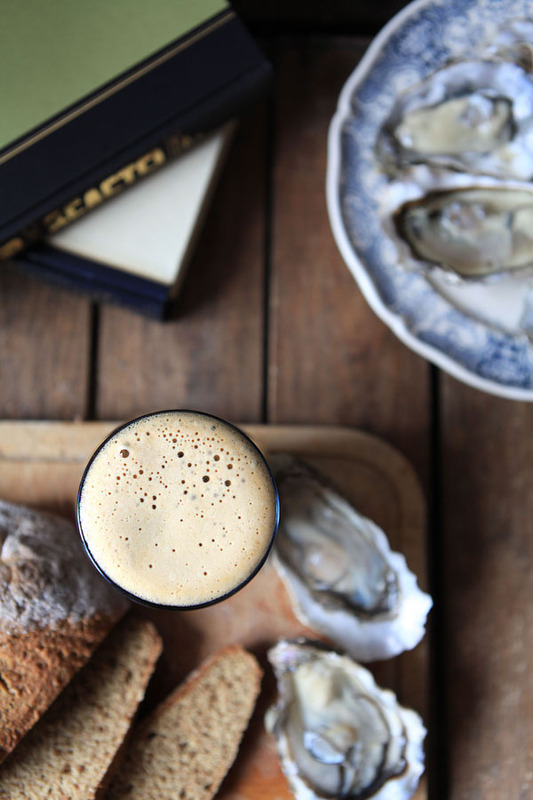 Soda bread, oysters and a pint of stout. A fisherman’s tea. I don’t want to be the one screaming ‘horse meat’ but I wouldn’t be surprised if this harmful E924 would still be circulating in our food chain. After all it isn’t banned all over the world and still used widely in the US. 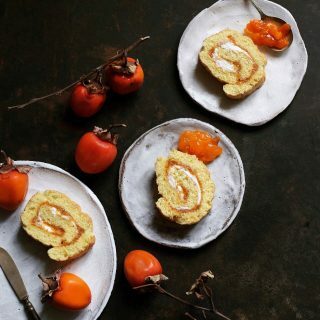 The Chorleywood method is used all over the world and not exclusively for the iconic square shaped loaf but also to speed up the process of regular bread. I’ve stopped eating store-bought bread unless I know it was made traditionally. Now I know some people might argument that baking your bread takes longer and one hasn’t the time to do this very often and I agree. 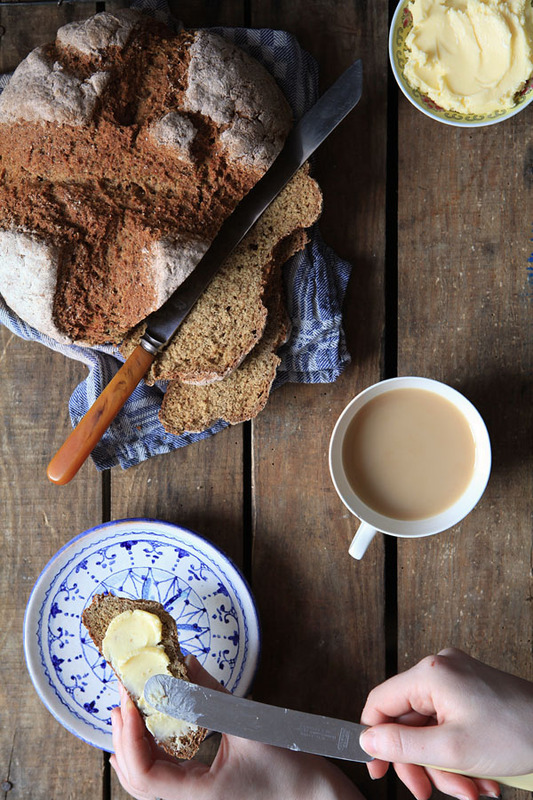 Baking this Soda bread is in my opinion a great alternative to baking your bread traditionally when in urgent need of it and no time to spare. Made with good quality organic wholemeal flour this makes a fine loaf in just 45 minutes – baking included. This is faster than hopping on my bike and driving to a store. Soda bread is an acquired taste but I promise you it is very much a treat on busy saturday mornings when all you need is to get on with things. 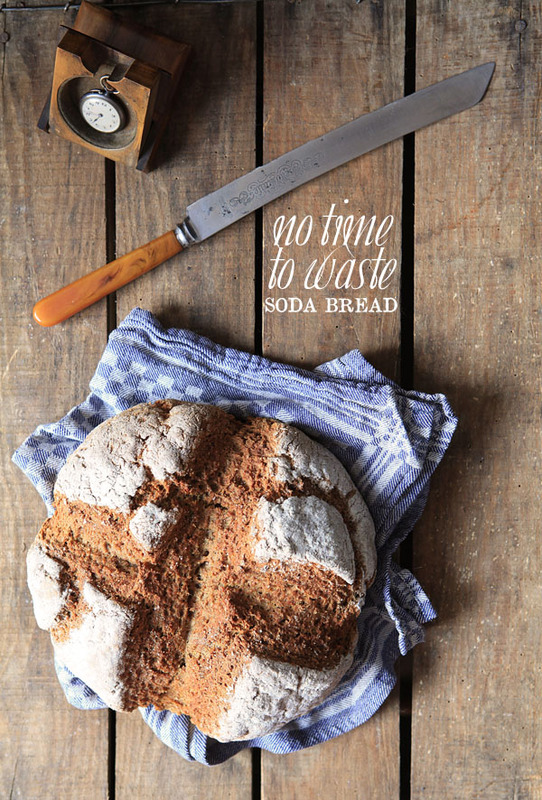 In soda bread Bicarbonate of soda is used as a raising agent instead of yeast or a sourdough starter, the process is activated by the acidity in buttermilk, live yoghurt or in some traditional recipes even stout beer. 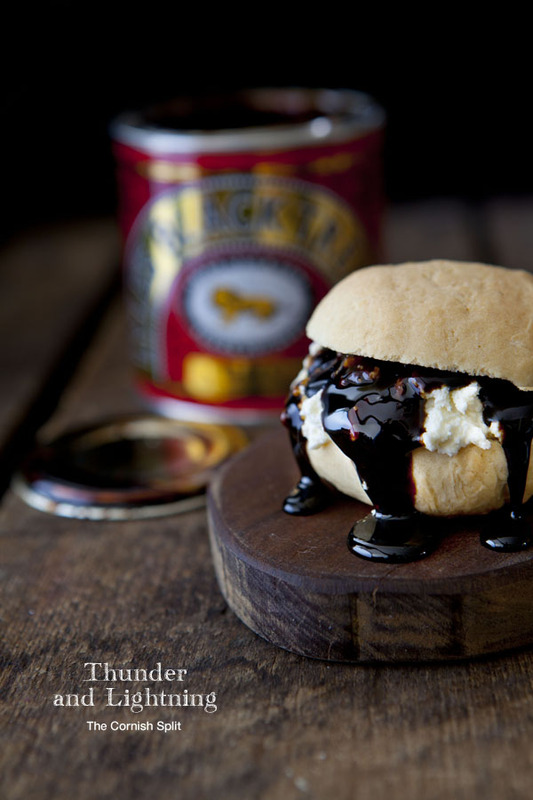 Buttermilk and live yoghurt contain lactic acid, which was also used in Milk stout beer before the usage went out of fashion. The lactic acid reacts with the baking soda and forms air bubbles of carbon dioxide. The trick is to underwork your dough and get it in the oven as fast as you can to get a good rise. Unlike the chemicals used in Chorleywood method, baking soda and lactic acid from buttermilk, yoghurt or beer, isn’t harmful to your health. 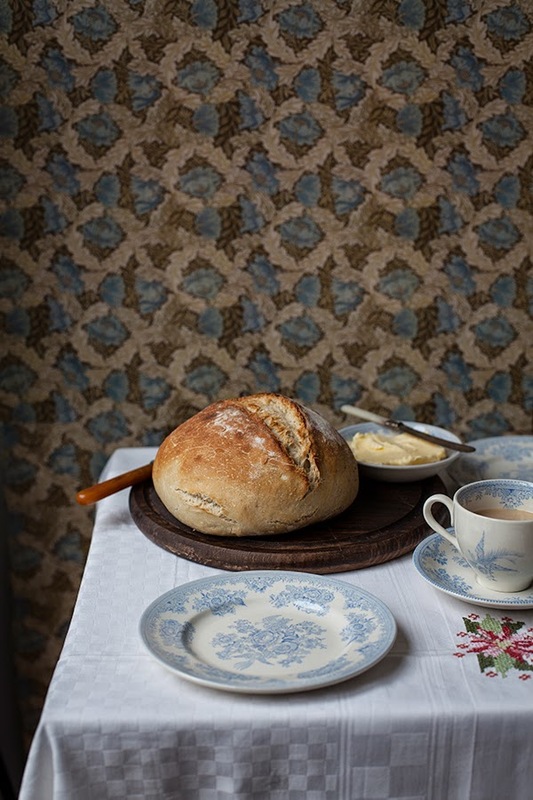 In Ireland Soda bread is often eaten with oysters, before the decline of oyster beds they used to be a cheap source of protein. The tale goes that down at the harbour pubs, fishermen used to get served soda bread and oysters along with their pint of stout. I must say it is a treat indeed, the bitter taste of the stout pairs perfectly with the salty oyster especially when fresh and still drowning in seawater. 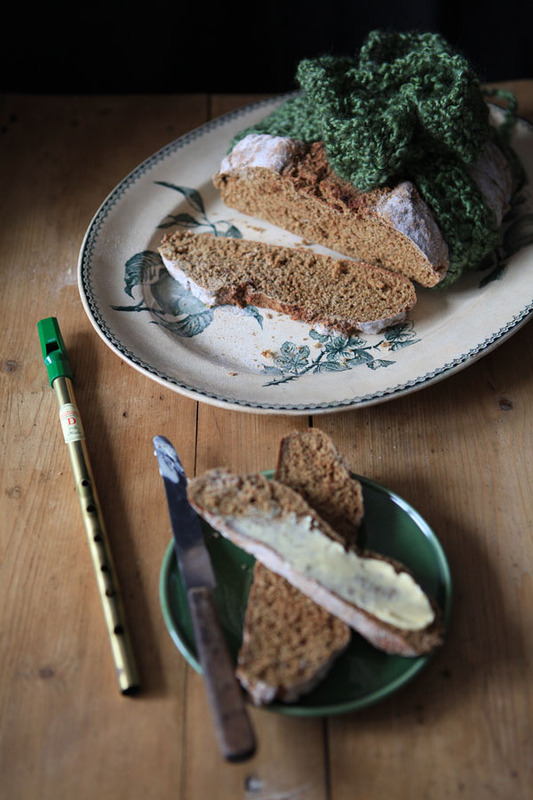 The soda bread brings a slightly sweet and sour taste to the table, along with a crumbly texture. So now perhaps a treat only enjoyed on special occasions. Add the buttermilk, milk, yoghurt or stout – whatever you chose – and mix with the dry ingredients. Quickly form a wet dough – it is important to get the bread in the oven as quickly as possible and not to overwork it – dust it with flour and cut a cross half way down the dough. Put on the baking tray in the oven for 40 minutes. For a smaller loaf, split the recipe in half. 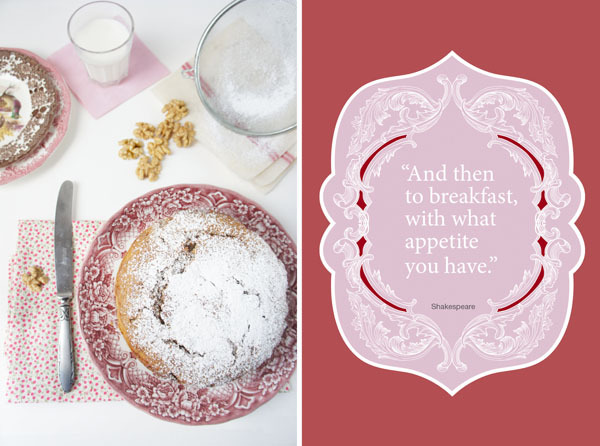 Breakfast is the most important meal of the day, we all know it. In Britain and Ireland the day is started as a king with their traditional cooked breakfast “the iconic fry-up”. Cooked well, the “English breakfast” truly is a wonderful dish. If you want to do it right you should start with a bowl of cereal and a piece of fruit, fresh juice and finish the meal with a slice of toast topped with marmelade. Last but not least, all this must be washed down with a nice cup of tea. If this isn’t a hearty breakfast, I don’t know what is. Naturally you can’t eat like this every day, most people only treat themselves on a traditional “Full monty” when on holiday or on special occasions. So alternatives are beans on toast or perhaps this breakfast cake. 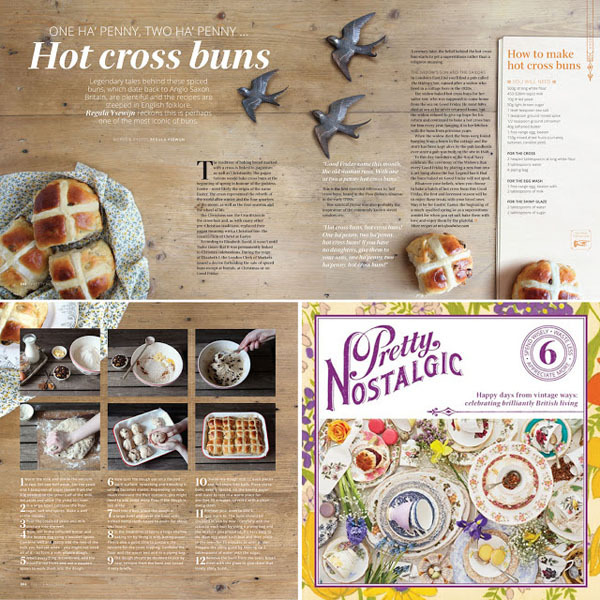 Also perfect with your ‘four O’ clock’ cup of tea and much better than a candybar. 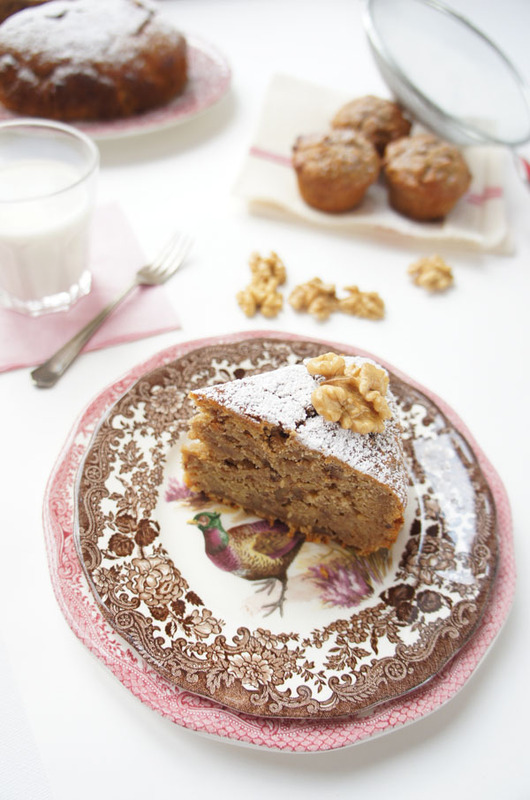 This breakfast cake is very moist and more a cross between a bread and a cake. 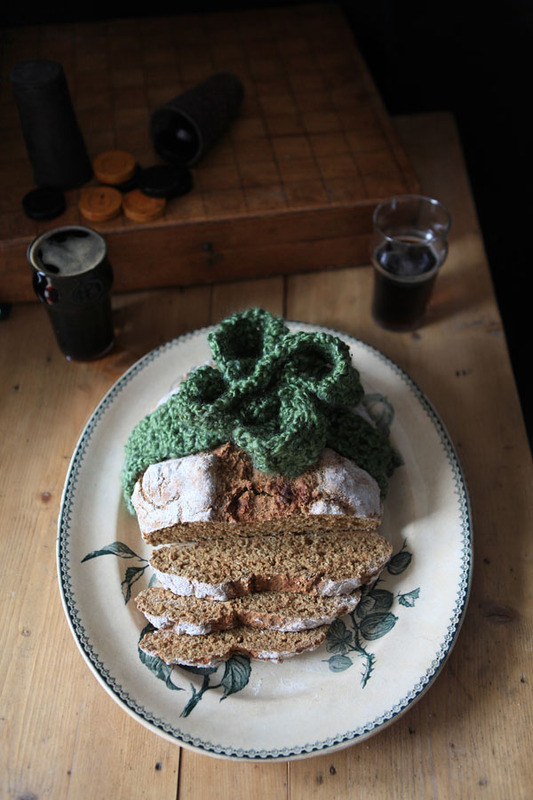 Someone from Ireland told me it also resembles an “Irish tea brack” though this is not made with tea. I left out the “normal” sugar in this cake and substituted with honey and apple sirup. This makes this cake a healthier treat. Grate the parsnips and apple. Mix the flour, mixed spice and baking powder. 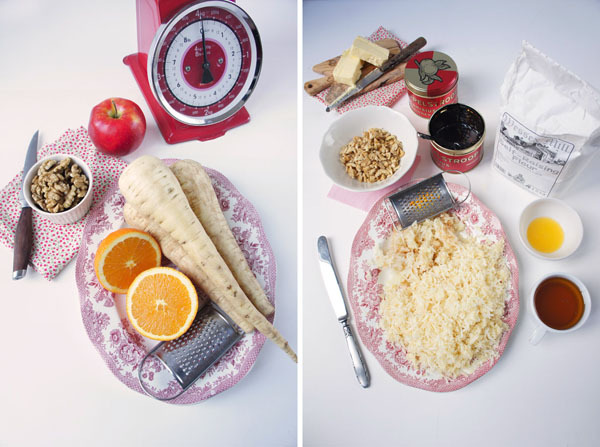 Add the egg and sirup mixture to the flour followed by the grated apple and parsnips. Finally add the orange zest an juice. Pour the mixture into the prepared cake tin and bake for 1 hour. Let the cake cool in the tin and dust with Icing sugar when cooled. My cake tin was a bit smaller so I made some smaller cakes from the leftover dough, ideal to stick into boyfriends’, husbands’ or childrens’ luchboxes.